Billy boarded the train to Minneapolis. He had come to Los Angeles months before as a small-time preacher. Now he was leaving as one of the most recognized Christians in the country. It was not what Billy had sought; he'd just been open for God to use. Billy wondered if this would be the peak of his fame or if something bigger was about to happen. 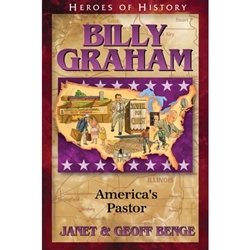 The oldest son of dairy farmers from Charlotte, North Carolina, young Billy Graham attended evangelical revival meetings that inspired him for the rest of his life. As an ordained minister, he rose to prominence and would subsequently preach the Christian message to over 200 million people in 185 countries. Graham championed civil rights, befriended US politicians and presidents, and traveled the world to places no one else dared to go. His life and ministry have shaped the spiritual life of America and offers hope for the future - inspiring new generations of leaders willing to serve with courage, integrity, and vision. Graham's message continues to ring true today: There is opportunity for repentance, and for a great light to shine -- the light of the gospel of Jesus Christ (1918-2018).